Sunday, in light of the recent election, my pastor, Derek Holmes, made an interesting analogy. He said that, in light of the fact that morality and faith are becoming increasingly passe, Christians get to be rebels. I have long held a different view, and I have held it for quite some time. I’ve just felt a little insecure about writing about it. I believe that Christians are the new JEDI. We wear weird clothes. We dress in a way that makes us stand out. Distinctive, but not abnormally so (in most cases). We are perceived as a little mystical. We believe in the other worldly. We study ancient texts. And if we don’t, we should! We are trained by those more experienced. The Jedi have padewan learners. Christians have disciples. We gather in a temple. Or temples. We attempt to control our anger. When we are unsuccessful, things go awry. What did I miss? 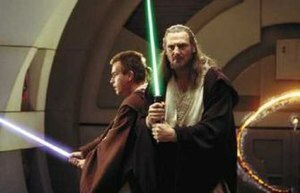 How are Christians like Jedi? How are we different? Should we as believers be issued lightsabers? Did Han shoot first?